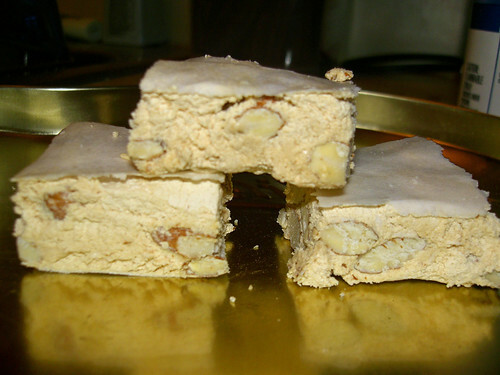 Torrone is an italian nougat candy that we would always have around Christmas with my Mother’s family. If you buy it at the store it comes in an awesome box of individually wrapped pieces and different flavors…almond, lemon, orange. They are delicious. Its soft with an edible wafer on the outside and not too sweet or heavy, so its a nice change from a lot of other christmas treats. Since I live in Indianapolis now, a lot of food I used to love to eat (I especially miss chinese food) just can’t be found here, or it resides in a chain restaurant, sad and americanized. But I am getting off track here. The point is there is no store in Indianapolis that has this candy. I really wanted some so I decided I would try and make it myself. I found a reasonable sounding recipe on MarthaStewart.com (Martha has never done me wrong on a recipe, so generally I trust her) and set out to find edible rice paper for the top and bottom wafer of the candy. Really I think the wafer is there just so the candy doesn’t stick to your hands, so if you wanted to make this and didn’t have a candy/cake supply store in your town, you could either order off the internet or just do without. But I wanted to keep it as real as possible, so I used the wafer. In theory, this recipe is very simple. There are not a lot of ingredients. But for candy making I don’t think the ingredients are the most important part of having a recipe turn out. Candymaking is more like chemistry, there is a lot of precision involved with temperatures, measurements and volumes. So to start, I beat the egg whites until they were stiff, and added powdered sugar. 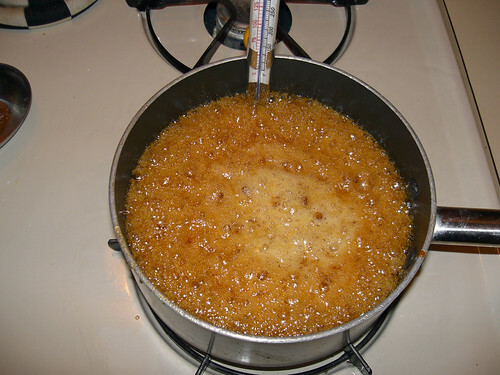 While that was happening, I combined the sugar and honey in a saucepan over medium heat. Now Martha says ‘stir occasionally’. DO NOT STIR THIS. If you feel the need to stir, put down the spoon and just swirl the pan around. If you stir this mixture too much, your candy will be grainy because crystals will form in the sugar. Just swirl, and gently. And keep an eye on the thermometer, you don’t want it to burn, and you don’t want it below 320 degrees F, otherwise your candy will be too soft. See what I mean when I say its easy but its not easy? don't touch! its like molten lava, and it will stick to your skin. Once it gets to 320, take it off the heat and stir, keep stirring until it gets back down to 300. 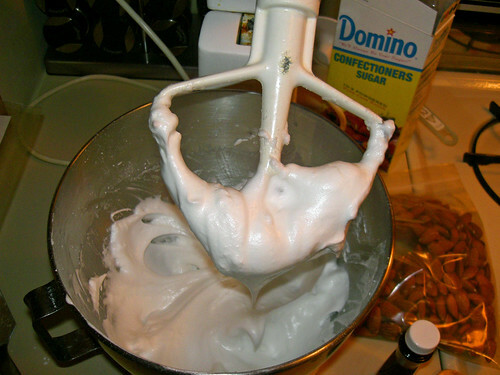 Turn your mixer back on low, carefully pour your molten sugar into the egg whites. The egg whites will bubble up for a minute, then once they settle down, turn the mixer up, and let it beat until the candy lightens in color, looks a little shiny and is stiff. 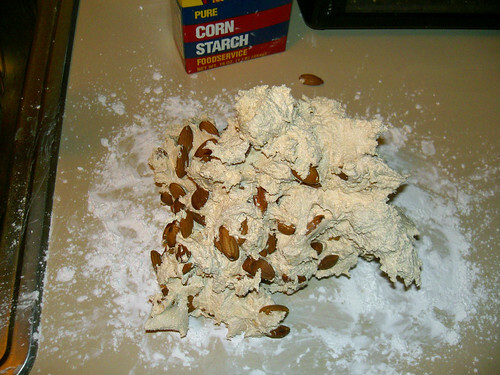 I deviated from the recipe here and added flavor ( lemon extract in one batch, almond in another) and your nuts (i did pistachios with the lemon, and almond with the almond) and dump this mess out on a cornstarch covered counter. Now being nougat. This stuff is sticky. It will be sticking to everything, the bowl, the paddle on the mixer, your fingers, the spatula, everything. And it is hot. So getting it on to the counter is a little tricky. I broke my favorite silicone spatula, RIP. And once its on the counter, you need to knead it a few times. I don’t know what the benefit of doing this is, but Martha said to, and so I did. Once that’s done, it is considerably less sticky, but still a little warm. I had already lined my pan with the rice paper, so I just smooshed the blob into the pan. It was about the consistancy of playdoh, so its not hard to do at all. suprizingly cutting was the easiest part. I placed the other layer of rice paper on top. 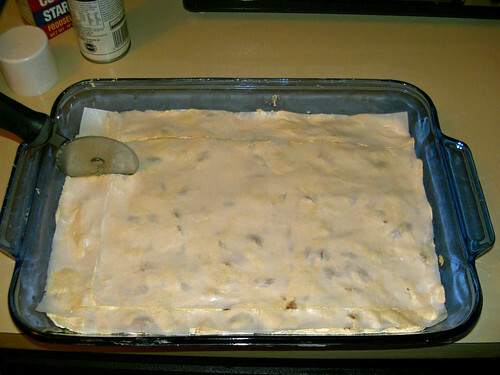 I had to moisten it a little bit to get it to stick to the candy because of the cornstarch. I didn’t want it to fall off after I cut it. A pizza cutter worked really well to cut the candy. And here is the finished product. I think mine has a little more of a golden hue than Martha’s because I used organic sugar, instead of the regular white sugar. I highly suggest letting it sit overnight, because it tasted amazing the next day (and all the days after). When I first tried it after cutting into pieces, I was worried because it didn’t taste right to me. I guess it just needed time for the flavors to blend. It was fun trying something new, even if it was a little intimidating, and really messy.